Although we have covered this to a degree in the previous section on the interior, this is such an important subject that we thought it warranted its own web page. Galley gear and stores for immediate usage. 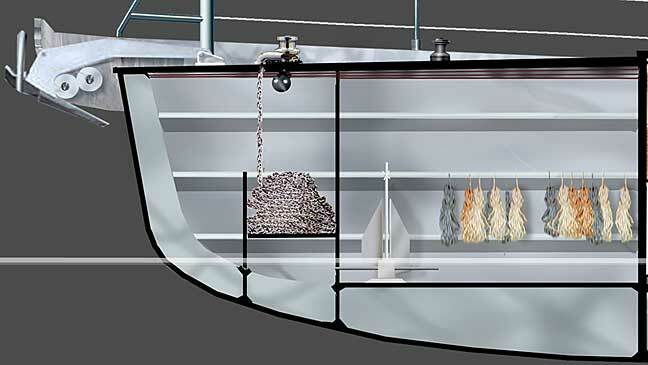 Long term galley storage and occasionally used pots and accessories. Personal clothing currently in use. Jackets, boots, foul weather gear for tropics and cold climates. Office equipment, supplies, and records. Tools, major spares, minor spares, filters, spare fluids (lube, hydraulic, coolant). Bulk stores like paper towels and toilet paper. Spare bedding and/or alternate climate bedding. Life jacket inventory for when lots of guests are aboard. And we are probably forgetting some categories. The point is, there is a lot of stuff that needs to be stored in an organized fashion, so you can find things easily, without tearing the boat apart. there is still room left over for a garage load of gear stored in a variety of ways. Wind Horse has 32 large bins into which we can place different categories of stores, with space left over for duffle bags of bedding, extra clothes, and suitcases. Here’s a photo of some of those bins we spoke about above. On Wind Horse some are used for galley supplies, others for engine spares, filters, electrical gear, plumbing supplies, wine, beer, potato chips, nuts, cereal, long life milk, pastas and rice, etc. The key thing is that each category of stores has its own bin making it easier to find what is desired and keep track of the inventory. These bins nest when not in use, so the basement area is opened up. Access to the basement is via a series of salon sole hatches. 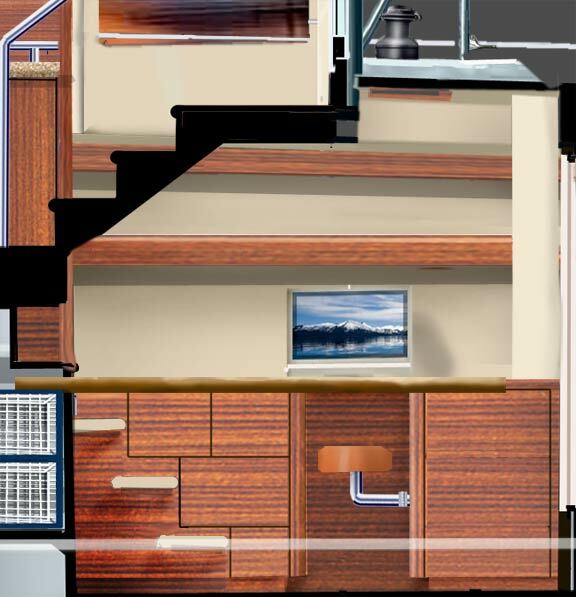 The port profile of the galley above shows more of the storage details. You can see the lockers on top of the counters. The lockers along the side window and across the fridge/freezer box have hinged lids which open up, exposing the entire locker to view. 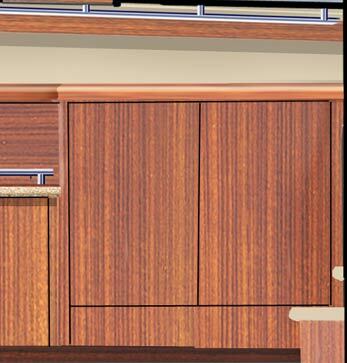 The taller locker on top of counter aft (which runs under the aft window) has sliding door access, with interior shelves, and space on top for cook books, baskets, and special appliances you might want handy. 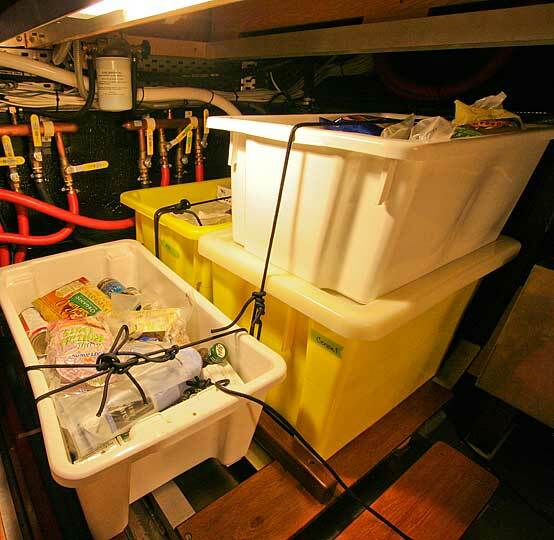 The the foul weather gear/jacket locker at the aft end of the galley is shown with hangers on top of the steps. The fridge box is shown on the right. In the center you can see the drawers adjacent to the sink (where the drawer style dishwasher and speed oven go), and then to the middle left, a cut through the wide, athwartships drawer stack. There is a deep locker under the sink, with lots of space for washing supplies, a trash bucket, and other items. As much space as this represents it does not include the easily accessed basement storage for long term inventory. Because you have the basement for long term requirements all of the galley level storage can be used for utensils, dishes, appliances, and immediate food stores. 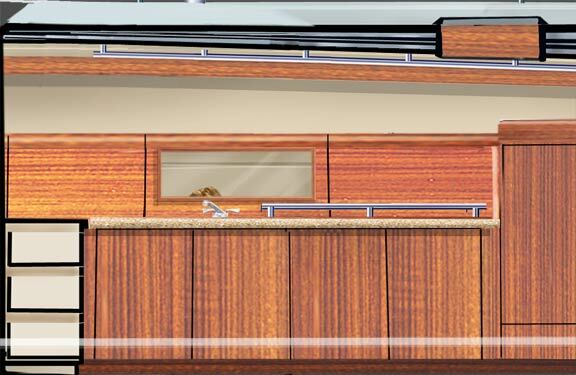 Add to this the massive amount of fridge and freezer space – 28.5 cubic feet / 805 liters – and you will see why we say that the FPB 64 has more galley storage space than any other yacht we’ve ever built. 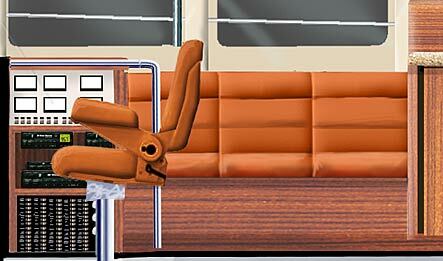 The lockers opposite the galley, on the starboard side of the salon, will see a variety of uses. Looking under the counter first, the lockers to the left (above) house the washer and drier (the doors open, and then slide into pockets). The under the counter locker aft is shelved, and will be handy for all sorts of items you might want to take with you on deck. On Wind Horse the lockers on top of this counter are used for camera gear, binoculars, signaling equipment, portable VHF radios, etc. The seat bases in the salon provide another area for bulk stores. This applies more to the port side than the starboard. However, we think you will find the basement more convenient most of the time as it is a lot easier to open the floorboard, drop down and find what you need than to remove cushions on the seats. 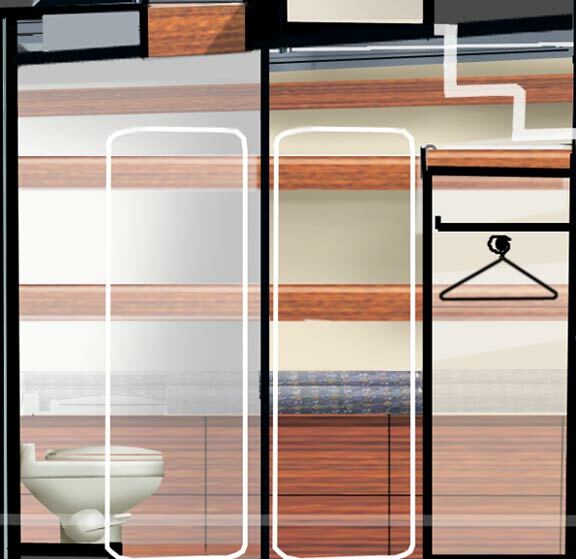 The master stateroom also has an enormous amount of easily accessed storage. The bunk has six drawers as well as bulk storage outboard of the drawers under the mattress. These drawers, are a primary location for everyday large clothing items. At the forward end of the stateroom, on the opposite (starboard) side you have a bureau with drawers against the bulkhead (perfect place for lingerie, jewelry, socks, and other smaller items). On top of the counter is a long locker with an intermediate shelf, accessed by the same style of hinged doors as are used in the galley. Lots of space for toiletries, hair dryers, tooth brushing gear, etc. On Wind Horse this area is also used for storage of our everyday and emergency medical supplies. 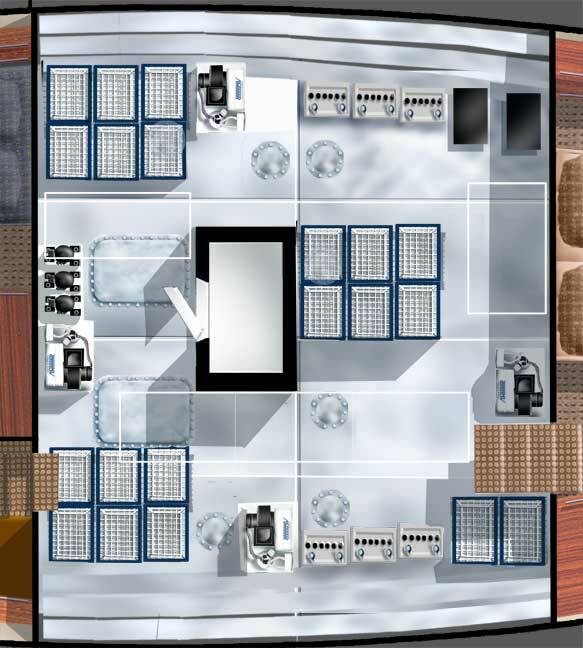 That large hanging locker (above) is at the aft end of the stateroom. There is lots of space here for everyday clothing. 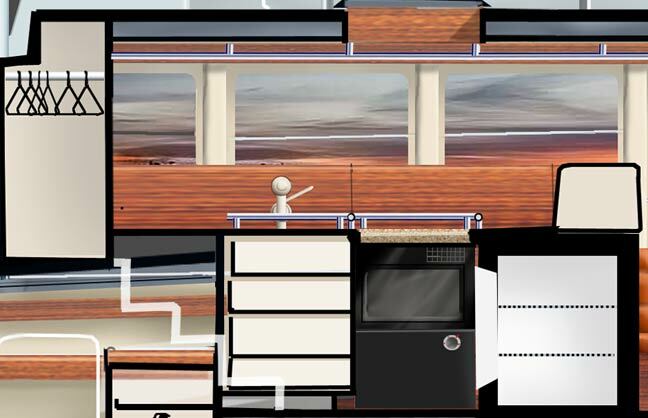 If you add to this the space in the locker at the top of the stairs as you enter the boat (where jackets and foul weather gear will be stored) and the even larger hanging locker in the aft cabin, there is a huge amount of hanging space. And then when you are cruising in a warm climate, for example, heavy jackets and clothes can be packed in duffles bags (different colors of course for inventory control) and stored in the basement. Taking a closer look now at the office area opposite the aft stateroom. 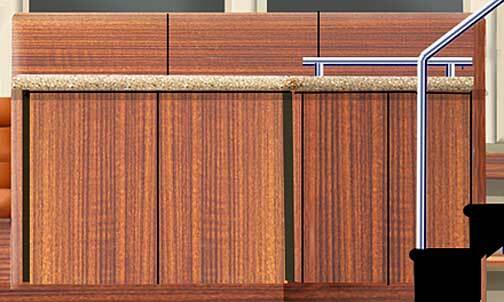 There is a variety of space below the counter, designed to be flexible in use, so usage patterns can change over time. At the aft end are two large shelves. These might be used for computer peripherals, or perhaps office supplies. This area could also house a compact computer CPU (or you might want it on top of the desk). Forward just below the counter are a pair of drawers which are sized to be used for file folders. Below this are a couple of locker doors which give access to shelf and bulk space under the desk top. 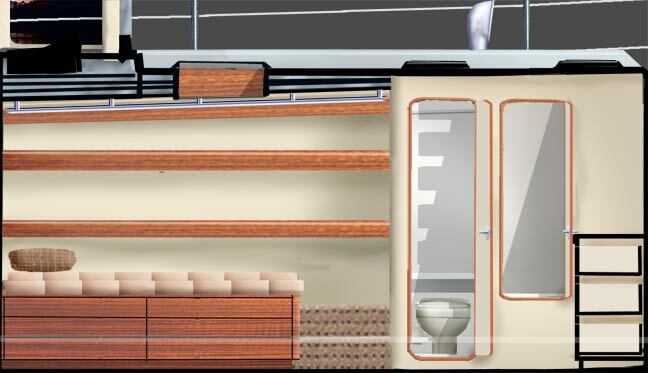 The aft sleeping cabin on the port side is a little tougher to illustrate. Under the bunks, of course, you have six tall and deep drawers. 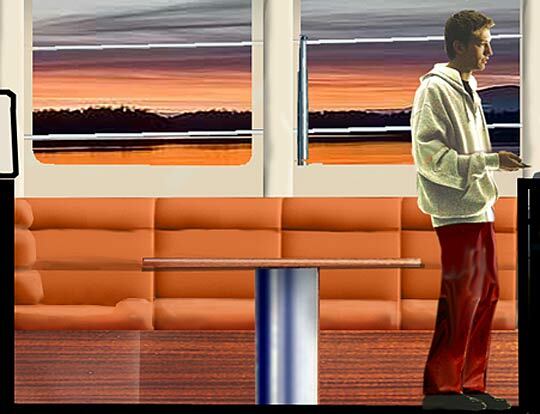 If you don’t have guests aboard, this is the sort of place for extra sweaters, sweatshirts, and fleece. 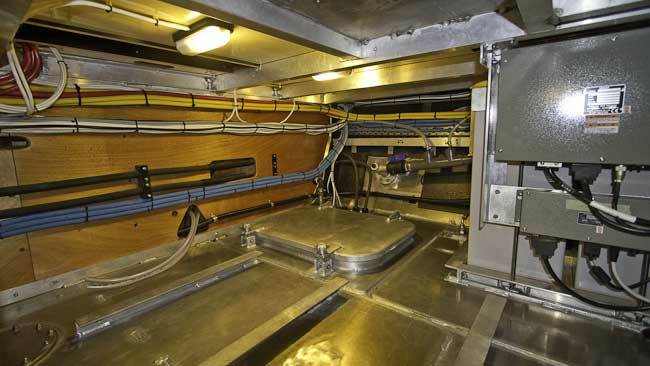 The large hanging locker situated on the forward bulkhead, which you are looking through here on the right, is a very important part of the storage system. Part of this hanging locker will be built with adjustable shelves, so that of you want extra shelf space, with good access, this is it. At the same time, you have up to 46″ (1175mm) of hanging space if you put the shelves away or use just the lower shelves. If you carry lots of shoes, for example, these shelves would be a great place to store them. Given the height available, this area is also adaptable for hanging more formal clothes. We’ve given the forepeak its own web page, so we’ll just cover it briefly here. This is comparable to the forepeak on the Sundeer 64, which has to store sails in its forepeak. There are no sails of course (except for perhaps the “get home sail”) with the FPB 64. But there are plenty of other categories of gear which find there way to the forepeak. With as much space as there is, we can tell you that on the FPB 83 this area is well used, with excellent access to all the many items stored in this area. Although we have designed and built many larger yachts, the FPB 64 has more user friendly storage space than any of our previous designs. The massive volume is available so you can efficiently store all the many categories of items a long range cruising yacht carries. The extra storage space makes it possible to keep gear separated, neatly organized, easy to find and inventoried. And most important, accessible without tearing the boat apart. If you would like more information on the FPB 64 please contact Sue Grant: Sue.Grant@Berthon.Co.UK. This entry was posted on Saturday, October 15th, 2011 at 6:26 pm and is filed under Dashew Offshore, FPB 64 Updates. Both comments and pings are currently closed. Even I have read most all on Dashew Offshore Website, I found this new version on Setsail interesting, cause of some adjustment and better or newer picture. But you write; <> You mean boat’s supplies, or maybe bosun’s supplies?? ?